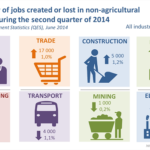 Statistics South Africa’s Quarterly Employment Statistics report released on Monday 29 September 2014 shows an overall growth of 1.8%, or 155 000 new jobs created, during the second quarter of 2014. This growth was recorded in the formal non-agricultural sectors of the South African economy. 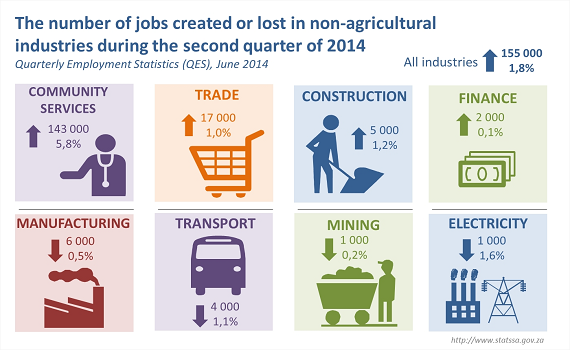 Job losses were documented in the traditional industries: manufacturing, transport, mining, and electricity. Average monthly earnings and gross earnings increased between February 2014 and May 2014, and March 2014 and June 2014, respectively. The report showed that an estimated monthly average of R15 169 was paid to employees in the formal non-agricultural sector during May 2014. This entails a 3% quarterly increase between February and May this year, and an overall annual 4.6% increase between May 2013 and May 2014. Mining tops the table for gross earnings with R24 million and community services trails at the bottom with a meager R132 373. Manufacturing showed the highest year-on-year change of 6.1%, while electricity the lowest with 4.5%. The highest quarterly positive change was in the transport sector with 5.3% and the lowest in finance with a 5.4% negative change. The entire report is available (PDF, 1.2MB) on the Statistics South Africa’s website. Should You Report When the Public Doesn’t Care?